In fiction, our characters often have to skirt around some delicate issues. Non-Fiction is no different. 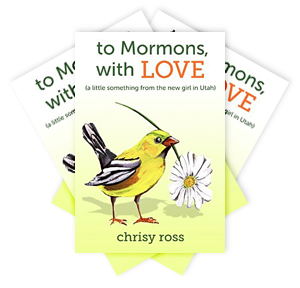 Today's guest is Chrisy Ross, regular contributor to LDSLiving magazine, and the author of To Mormons, with LOVE (a little somethingfrom the new girl in Utah). Chrisy's book explores her introduction to Mormon culture through a non-member’s eyes. Betsy: So first of all, what made you decide, "I need to write a book about this"? Chrisy: When people discover we’re not members in a 99% member community, they’re interested to know how we ended up there and almost always ask, “What’s it really like?” Most of these people happen to be LDS and are curious about our family’s experience. I toyed with the idea of a full memoir, but niche nonfiction was a publishable idea per the all-knowing Internet, and I felt sincere about the project idea. After years of ambling through culture shock, finding my social footing, seeking to understand the foundation of a misunderstood religion, and recognizing my own biases—I wanted to share, entertain, and ultimately express love to my community. Betsy: Religion, in general, is a very sensitive subject. Were you worried at all about stepping on toes? Chrisy: Yes. I knew that the spirit and intent of my words weren’t harmful or radically polarizing, but it was important that I chose those words carefully to minimize any unnecessary bristling. Thankfully, I had wonderful critiquers. I didn’t expect everyone to like my book or to corroborate my perceptions, but I didn’t want anyone—particularly my friends and neighbors—to feel like I’d been exploitative. Betsy: In your book, you really put yourself out there. You are very open and honest about your feelings and reactions to our little world of "knee shorts" and "oddly good-looking children". What would you say the Mormon reaction has been? Chrisy: Overwhelmingly positive, supportive and generous. If there are any true haters (something I doubt), they’re hiding in the bushes. And apathetic people are always quiet. Mormon readers have taken the time to write lengthy emails, sharing stories—both funny and moving—about their experiences with cultural issues. I’ve heard from men, women, stake presidents, teenagers, people of all ages and from all over the United States. I’m thankful and touched by those who’ve enjoyed my book—their openness (in every sense of the word) and willingness to lovingly share details of their lives. Betsy: One of the general rules of writing is "Know thy audience". A big part of that audience would be Latter-day-saints. A group that you, admittedly are not a part of. How do you approach that hurdle? Chrisy: I live in Mayberry, Betsy. I “know thy audience.” Wasn’t much of a hurdle at all. Plus, the more I fretted over “thy audience,” the more my friends and critiquers (all LDS) reminded me…we’re all just people. “What’s funny to you is funny to Mormons, too.” They were right. Betsy: Thanks again for dropping by, Chrisy. Tell our computer audience where they can pick up your funny and fabulous read. Chrisy: I’m honored and humbled to chat with you here. Much gratitude to you and your readers, Betsy. My website http://chrisyross.com has links to booksellers’ sites for paperback as well as digital copies. You can also find the book in regional Deseret Book and Barnes & Noble stores, BYU Bookstore, and other independent LDS book stores. Is shunning something we still do in 2012? Lots of great new fiction to explore here! I popped over from A-Z Challenge and look forward to your challenge posts!